The Little Street by Jan Vermeer depicts a small fragment of Delft, his hometown and place of residence. 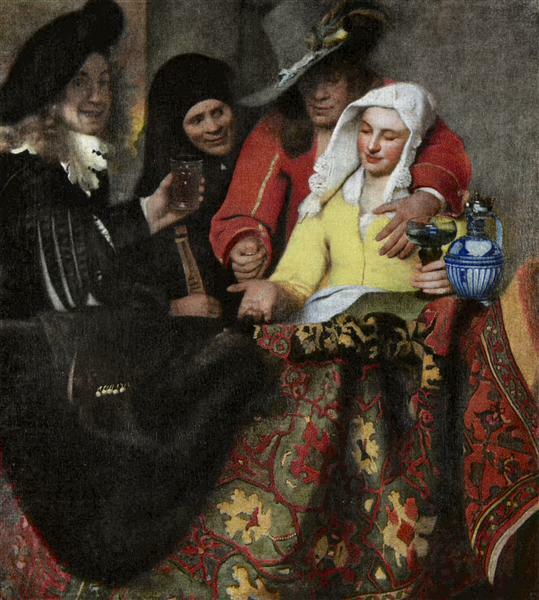 The small painting (54.3x44 cm) is a significant piece in Vermeer’s body of work. Besides the famous View on Delft (ca. 1660-1661), The Little Street is the only other recognized townscape created by Vermeer. Although there are records of another townscape painted by Vermeer, it remains unknown and lost. Just like Vermeer’s famous interiors, The Little Street embodies qualities of intimacy and domesticity. The artist shows the beauty found in the mundane, the figures of women and children going about their daily activities. The women diligently cleaning and doing needlework in front of the simple households represent the ideal of domestic virtue. The vine growing on the building on the left also relates to domesticity, as it was considered a symbol of love, fidelity and marriage since ancient times. The subject was possibly inspired by the art of Pieter De Hooch’s, paintings such as A Dutch Courtyard (ca. 1658) and Courtyard of a House in Delft (1658). De Hooch, a Dutch Golden Age painter, was Vermeer’s contemporary and a member of the Delft Guild of Saint Luke. Since both resided in Delft, it is very possible that the two were familiar with each other’s work, as they share similar qualities in terms of approach and technique. An interesting aspect in Pieter De Hooch art was his tendency to combine architectural elements from a variety of sources to compose new spatial arrangements. Even though these were imaginary constructions, De Hooch was successful in making them compelling and realistic. Like De Hooch, Vermeer presumably made similar adjustments in The Little Street in order to create a more interesting composition. For instance, the doorway in which the woman sits doing handwork, should be aligned with the center of the building and at an equal distance from the two sets of windows. 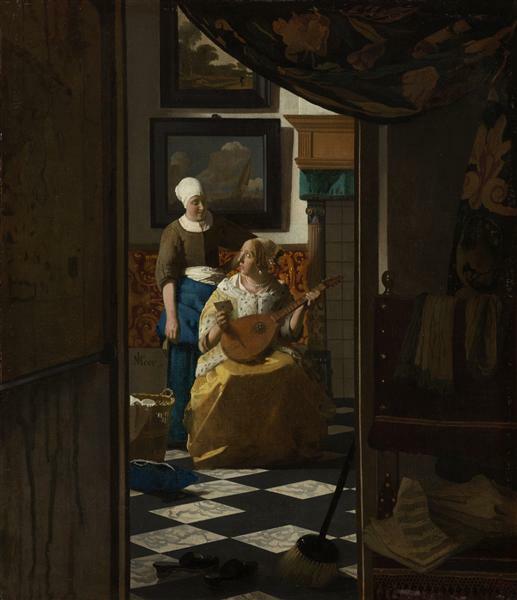 Vermeer ignored this in order to include the red shutter and part of the window, which gave a sense of completion and balance to the composition. 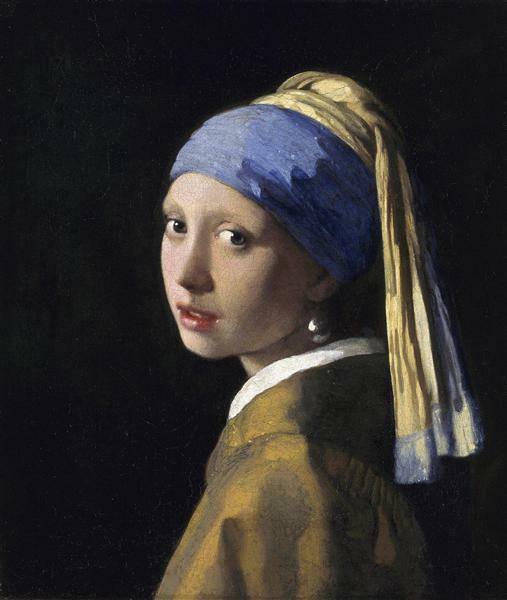 In addition, it has been speculated that Vermeer joined the two buildings that were in fact separated. 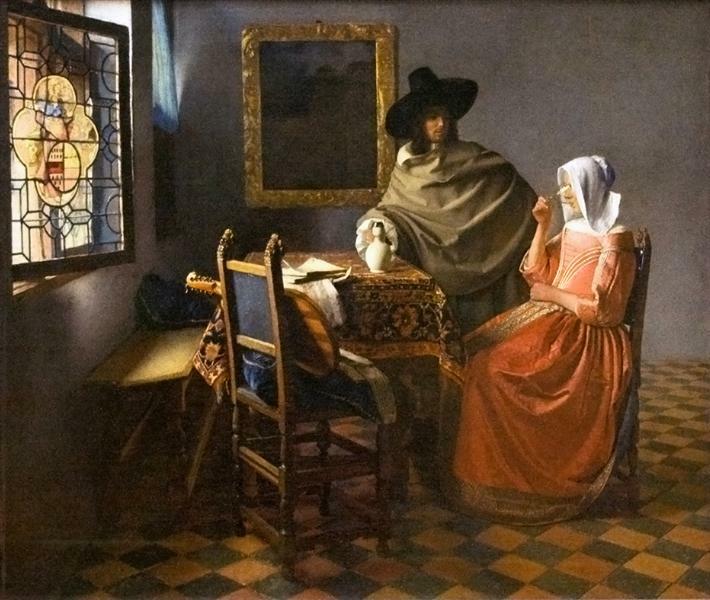 Over the years, many art historians tried to identify the actual location portrayed in Vermeer’s painting, but no consensus was reached. Recently, new research presented evidence that the location is Vlamingstraat in Delft, more precisely present day numbers 40 and 42. The identification was made based on archival study of the quay dues register from 1667. The register contained detailed accounts of the width of all the houses and passageways that lined Delft’s canals in Vermeer’s time. Presently, the only recognizable element from Vermeer’s painting is the small passageway leading to a courtyard or garden. 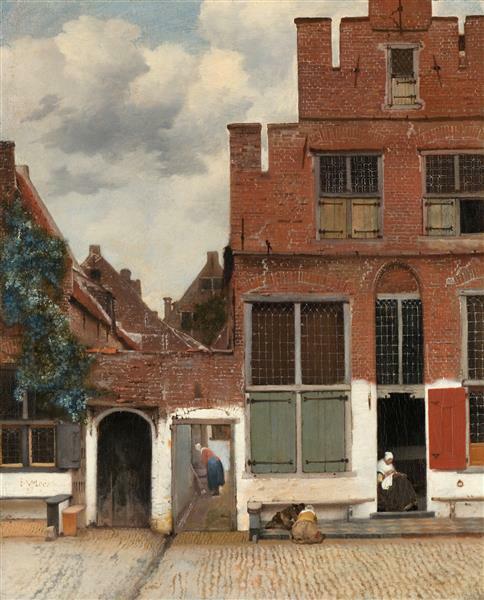 It was also discovered that the house on the right belonged to Vermeer’s widowed aunt, Ariaentgen Claes van der Minne. In addition, it is known that Vermeer’s mother and sister lived on the same canal. Therefore, The Little Street possibly had another dimension because the artist might have had personal memories associated with the location. The Little Street (Het Straatje) is a painting by the Dutch painter Johannes Vermeer, executed c. 1657–58. It is exhibited at the Rijksmuseum of Amsterdam, and signed on the left hand corner below the window "I V MEER". Straight angles alternate with the triangle of the house and of the sky giving the composition a certain vitality. The walls, stones and brickwork are painted in a thick colour, that it makes them almost palpable. 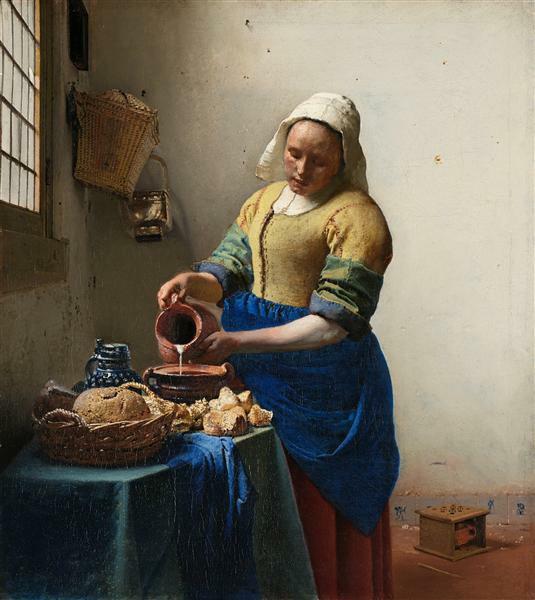 Vermeer achieved the realistic depiction of the surfaces with the masterful application of a relatively limited number of pigments. He employed red ochre and madder lake for the reddish-brown brick wall, the blue in the sky contains lead white and natural ultramarine. The green shutters and foliage are painted with azurite mixed with lead-tin-yellow. While generally agreed to depict a contemporary street scene in 17th-century Delft, where Vermeer lived and worked, the exact location of the scene Vermeer painted has long been a topic of research and dispute, with studies arguing for the Voldersgracht, where the Vermeer Centre is located, or the Nieuwe Langendijk at the present-day numbers 22 to 26. Later archival research based on the city's quay dues register, which gives detailed measurements of all houses and passageways at the time along the canals of Delft, has resulted in the conclusion that the site is the Vlamingstraat, a street with a narrow canal, at the present-day numbers 40 and 42. 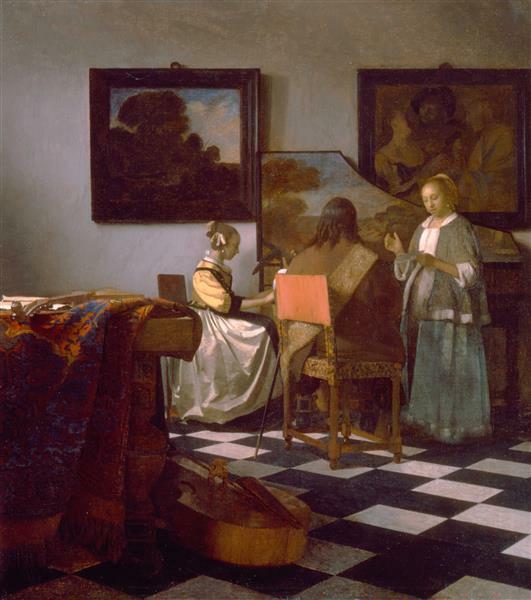 The property on the right in the painting belonged to Vermeer’s aunt, Ariaentgen Claes van der Minne. She had a business selling tripe, and the passageway beside the house was known as the Penspoort , or Tripe Gate. Vermeer’s mother and sister also lived on the same canal, diagonally opposite.